Hi, I'm Paul McGuigan. I'm originally from Cavan but have been living in Galway for the past 12 years. My family used to come here on holidays when I was small and I always felt this town had a dreamlike quality-there's magic in these streets. 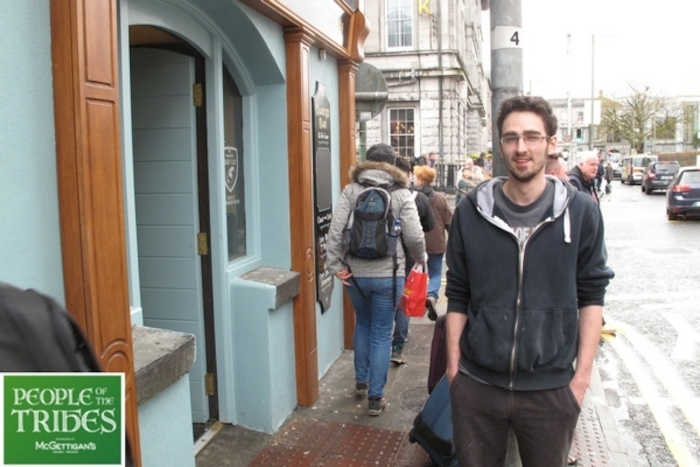 I originally came to Galway to study art and design in GMIT. Like the song, I lost my heart to a Galway girl and have been here ever since. After college, I decided to become a traditional signwriter. I was taught how to hand paint signs by John Herrick, a great artist based on Dominick Street. I used to make vinyl and plastic signs back home in Cavan but I feel the hand-painted signs have a soul to them that computer-generated signs can't match. The person on the street can sense this instinctively. More and more businesses are realising this, and want that authentic look and feel. Sign painting is alive and well in Galway. I feel really lucky to live here, to see the Clare hills each morning across Galway Bay. Sometimes when I'm up the ladder painting a sign I look at the town buzzin' away around me and can't believe I get to make my mark on the place that's made such a mark on me. You can see my work around Galway and on Instagram. People of the Tribes: Meet Fred.